Fall is definitively the best season for fashion lovers! 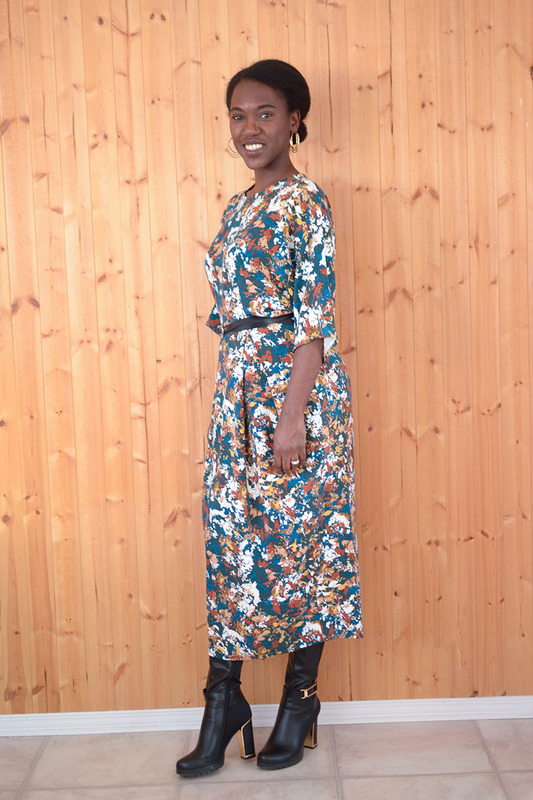 In this post I’ll share this midi length dress I created for the fall blog tour. 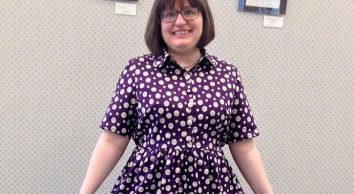 This dress was on my fall sewing project list and I was happy to find the perfect fabric for it while looking at the new fabric collection at Fabricville. 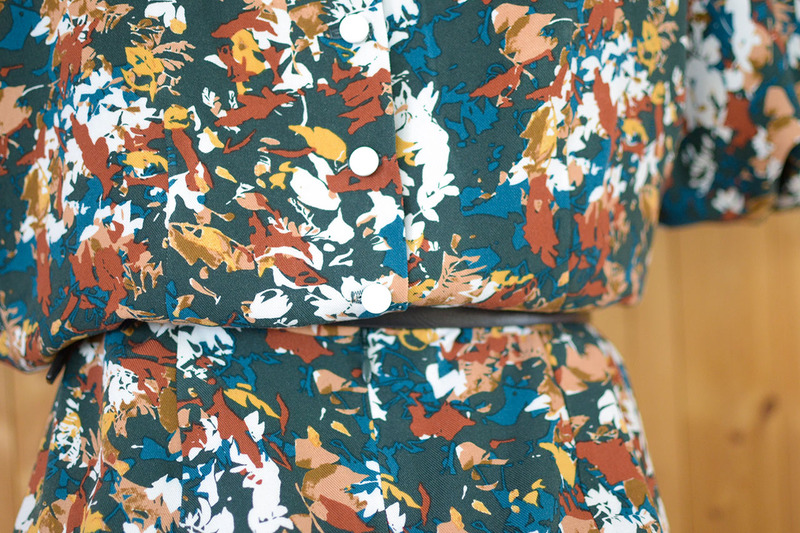 The fabric I selected is a Lana Rayon Twill in the color Abstract floral – hunter green / burnt orange. The colors mixed together guaranteed the perfect fall outfit! I really love the drape of this fabric. The fact that it was not too light and opaque made it possible for me to create this dress and wear it with a lining. However, it is recommended on the website to line this fabric. I simply chose not to. The fabric was easy to sew. I used an 80/12 needle throughout the project. I used a fusible knit interfacing to stabilize the neckline and the button/buttonhole band. I cut my dress at a 12 (bodice) – 14 (waist) – 12 (hips) following the finished measurements indications on the pattern. It gives a loose fit which is perfect for the look I was going for. 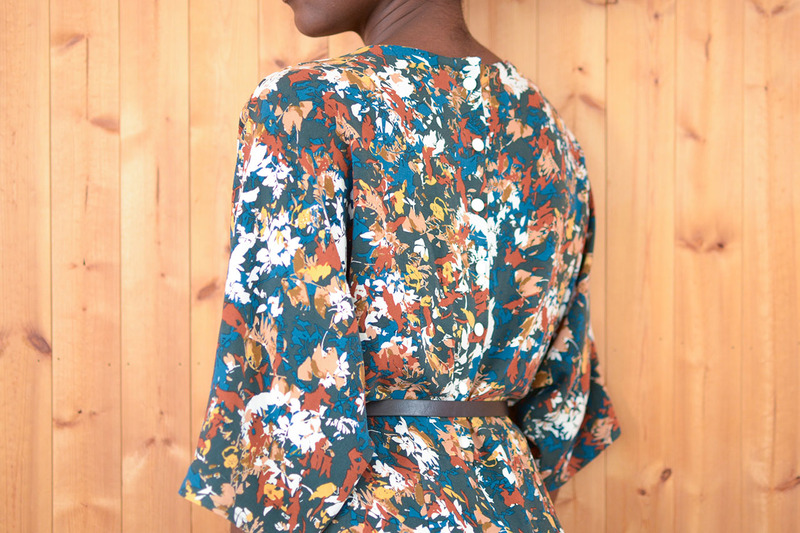 I made view A minus the pockets and shortened the sleeves since I did not get enough yardage for the longer length. This pattern is for the average sewist. 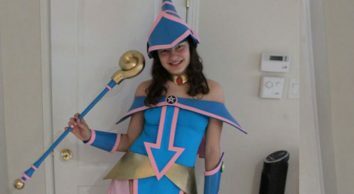 You’ll need to master techniques such as inserting an invisible zipper, making buttonholes and sewing buttons, creating darts and pleats. I know how invisible zipper installation can be a nightmare so if you need assistance, you can refer to my invisible zipper installation tutorial here. 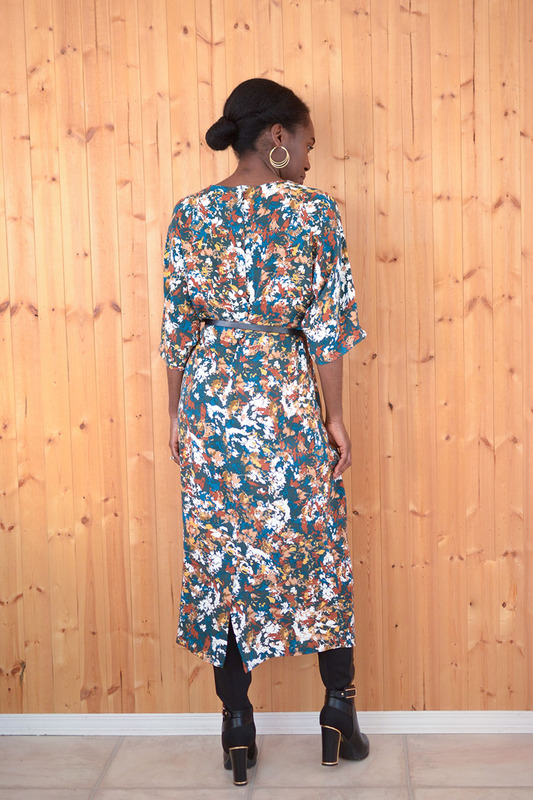 Wear this dress with a slim belt to define the waist. A classic pair of high-heel boots will help you put this look together. Through a trench coat on and you are ready to meet your girls for a brunch next weekend or meet your love on a date! I hope you enjoyed my latest creation. Let me know what you are planning to wear this fall. Bravo Judith, c’est très réussi! Your dress is beautiful Judith! I really love those colors on you. So beautiful! As usual 🙂 Love the combination of the sleek lines and the rich floral print. Cette robe est vraiment magnifique et te va à merveille. Bravo!